GASPING for breath and drenched in sweat and guilt, I looked around for a good excuse to be trespassing. After all, a burial ground is sacred, even if it’s one meant for the gentle giants — elephants. What I found though, were two almost-complete sets of elephant skeletons, nicely arranged on the forest floor in a fenced up area measuring about three square metres. All around was secondary forest and dense undergrowth near Kampung Star. The only visible path was the trail leading to the burial ground from the mouth of the walk-through Gua Pintu. The skeletons were of elephants aged between 35 and 40 years old, which died about two years ago. The bones, found scattered about in the area by the Wildlife and Forestry Department, were moved to and arranged at their present site. Chairman of the Persatuan Sahabat Sungai Nenggiri (Friends To Nenggiri River Association), Ahmad Karmizi Jalil, said the two elephants frequented the area towards the end of their lives. Unfortunately, he said, they left a young calf that had been making regular visits to its parents’ resting place even though it was already a member of a herd of 20 elephants. “Perhaps, it’s because of the strong family bond,” added Ahmad Karmizi who was leading a group of 40 Pressmen and travel agents to Gua Musang’s attractions. That touching anecdote and the fact that there were about 100 visitors earlier, made me feel even more guilty about being there as by doing so, we may have “chased away” the young elephant and its herd. There is no doubting though, the attraction of the elephants’ burial ground. To get there, one had to take a 15-minute boat ride on the rough Sungai Nenggiri and make a 45-minute trek that included a 15-minute caving adventure through Gua Pintu. 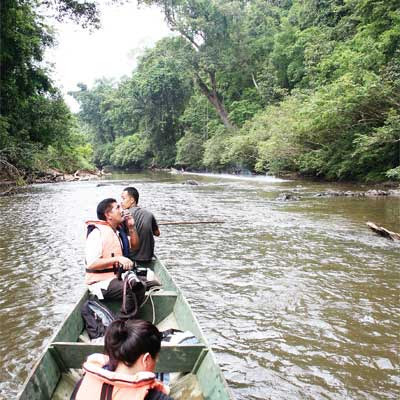 This gives visitors a taste of Gua Musang’s best – roughing it out at Sungai Nenggiri, a favourite with adventure seekers for rafting, caving and jungle trekking. An excursion to the elephant burial site would be the cherry on top of this adrenalin cake, a unique tourism product. But at what expense? I strongly recommend a thorough study to be done first on the environmental impact and the setting of guidelines on the number of visitors permitted in one day as well as dos and don’ts. Do elephant sacred burial grounds really exist? Two African-based websites dedicated to the pachyderm say “No”. Though both sites are based on African elephants, the logic behind their answers should apply to other species too. With age, an elephant’s teeth start to wear out, forcing it to find softer forms of food. Older elephants often spend their last days in an area where such food is found and so die there. This and the fact that the mammal is too large for its remains to be carried away by carnivores, is probably why elephants die in certain “designated” places. Even without the elephant burial ground, Gua Musang is still tops on the country’s list of best eco-adventure spots. There is always something to pump up the adrenaline – mountain or rock climbing, river rafting or tubing, wildlife spotting or fishing and caving, jungle trekking or off-roading, thanks to the rough waters of Sungai Nenggiri and the unique Taman Etnobotani. For the unfamiliar, Sungai Nenggiri is known for rafting and shot to international fame through Nenggiri Challenge, an annual rafting race. Race participants also walk through archaeological sites at caves — Cha, Chawan and Jaya — located along the river and then raft on a tributary that has been turned into a kelah (Malaya masheer) sanctuary. On the other hand, the Etnobotani Park is a favourite jaunt for rock climbers with 30 climbing routes ranging from Grade 5B for beginners to 7A and 7B for experts. It also offers facilities for camping, team-building and recreational activities. While these two and the beautiful peak of Gunung Stong are magnets for adventure seekers, Taman Negara Kuala Koh draws anglers. As eco-adventure tourism normally attracts adventurous budget travellers, this biggest district in Kelantan has launched its homestay programme in a big way on top of its small bed and breakfast lodgings. 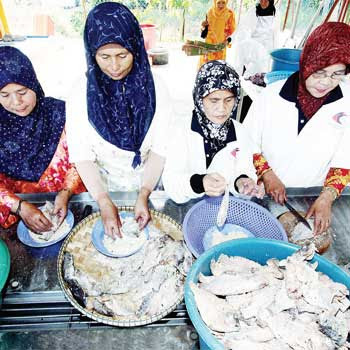 Among these is the award-winning Kampung Renok Baru, some 20 minutes north of Gua Musang. Gua Musang is the northern getaway to Taman Negara and the only official entry point in the State. Taman Negara Kuala Koh is part of the national park which covers an area of 4,343 sq kms and spans over the States of Kelantan, Pahang and Terengganu. Like Taman Negara Kuala Tahan in Pahang, Kuala Koh is also situated at the confluence of two rivers – Sungai Lebir and Sungai Koh. Sg Lebir is the main river that joins Sungai Galas to form Sungai Kelantan at Kuala Krai. Flowing down from the mountains of Tahan, Perlis, Penumpu and Gagau, these rivers have banks lined with giant trees like tualang and neram. The fruit of the neram is a favourite food of the kelah. This makes Kuala Koh a favoured fishing spot in the country. Making it even more interesting is the fact that fishing is only a 10-minute boat ride upstream from the Kuala Koh park headquarters which houses the Taman Negara office, chalets and dormitories and a small café. Another similarity it has with its elder sister Kuala Tahan is the newly-completed 300m-long canopy walk, 50m above the thick jungle floor. The highest platform on a tualang tree is 60m from the ground. Kuala Tahan’s canopy walk holds the record of being the longest in the world at 510m long and 45m high. Details, call Nik Nora of Taman Negara Kelantan at 012-965 4788 or Tourism Malaysia Kelantan office at 09-747 7554. Whether you are travelling solo or in a group, the homestay at Kampung Renok Baru is a good choice. Besides family-oriented and cultural programmes, there is a fair share of kampung activities, from rubber tapping and palm oil harvesting to traditional games like sepak takraw, congkak, fishing or even cycling around the village. 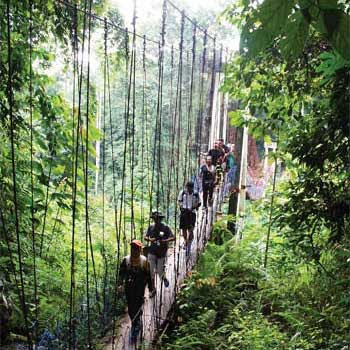 Or go the extra mile and trek through the jungle to the nearby Pelangi Waterfalls. Hungry for more? Head for Taman Etnobotani, Sungai Nenggiri, aborigine settlements, Taman Negara Kuala Koh, Gunung Rabung or the highland resort of Cameron Highlands. Kampung Renok Baru is only 14kms from Gua Musang. The best time for the homestay is during the fruit season as this is when the “new additions” to the family get a chance to pluck and eat fruit right off the trees in the orchards. Details, call Kesedar Operation Office in Kampung Renok Baru at 09-912 6340 or Tourism Malaysia Kelantan office at 09-747 7554. The town of Gua Musang is located in a territory bordered by Pahang in the south, Terengganu in the east, Perak in the west and Kelantanese districts of Kuala Krai and Jeli in the north. Since the little town is on the Kota Baru-Gemas railway route, going there by train is probably the best and most interesting way. A train ride from Kuala Lumpur via Gemas would take around eight to nine hours. By road, it’s three hours from Kota Baru and five hours from Kuala Lumpur. It is also linked to Cameron Highlands via the Simpang Pulai Highway. Express coaches and taxis are available from Kota Baru and Kuala Lumpur. There are regular flights to Kota Baru by Malaysia Airlines, AirAsia and Firefly as well.